Introductory notes on ordinary and partial differential equations. Assumed background is calculus and a little physics. 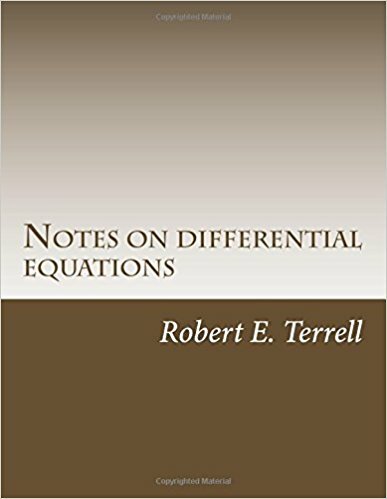 These are introductory notes on ordinary and partial differential equations. Assumed background is calculus and a little physics. Linear algebra is not assumed, and is introduced here in four of the lectures. Those four lectures have been used in the Engineering Mathematics course at Cornell University for several years. The notes as a whole have not been used as a text, but have been freely available for many years from the author's web page. The notes as written are quite close to lectures the author has delivered while attempting to explain various textbooks to his students. Some of the exercises have the format What's wrong with this? .... ?!? Most of these are errors taken from test papers of students in this class, so it could be quite beneficial to study them. - 2017-10-08: The book is no longer hosted in the Department of Mathematics at Cornell University. A mirror is available at archive.org.